Have you ever given a presentation and when it was over you said to yourself . . . “I should have been better prepared.”? Have you vowed in that moment of stress, frustration and with the sense of lost opportunity that “I’ll be better prepared next time.”? Then, as the next presentation came up like a speeding-out-of-control freight train, did you find yourself in the same dilemma? Maybe you have had these experiences and thoughts, yet you didn’t really know a great way to get that preparation. Never fear. That is the goal of this article – to give you specific actionable ways that you can prepare for the delivery of your best presentation ever. What follows are six suggestions for doing that. But before we get to those six approaches, let’s start with a major key to your presentation, and how it relates to your preparation. What do I want from my audience? For any presentation, you should be able to describe on the back of an envelope the most desired response from your audience – what do you want people to do, think or decide? With this clear goal in mind, all of your preparation will be placed into proper perspective. As you prepare for the details and stories and examples you are going to use, remember that in the end, your presentation is all about this most desired response. If you remind yourself of this, not only will you build a better presentation, but it will guide your preparation to be about the audience, and not yourself. With that context, let’s look at the six strategies. Get a real audience. The best way to practice is in real time. Gather your kids, your spouse, your neighbors, your co-workers or your dog, and walk through the entire presentation. Don’t talk about what you are going to say or how you want to say it; do it. Certainly if your audience consists of adults, you may want feedback from them on what they saw (your dog might not be much help in this case). Practice in the real space. Professional presenters want to see the space they will be presenting in before they go live. They want a sense of the room, the equipment and more. Why wouldn’t you want to do the same? If the presentation is going to be given in your office, the space itself might be familiar, however the exercise of delivering it in real time in that space is useful – with or without an actual audience. Put it on tape. With the technology that exists today, it is easy to record your practice – either on audio or video. This recording can be done in conjunction with either of the first two approaches, or in the case of audio as you sit at your computer. The power of the recording is your ability to listen back to it to review and critique how you did. The value of the playback will be hard to estimate until you experience it. Rehearse in your head. A less “real” approach is to go through the presentation in your mind, from start to finish, or by considering the flow and wording of a particular portion. The value of this approach is that you can do it anytime (in your car, as you exercise, while you sit at your desk, in the shower, etc.) and without any props or other people. Go through your visuals. 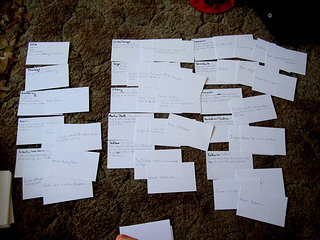 Before you gave a presentation in high school or college you likely reviewed your note cards as a part of your preparation. That strategy, translated to today, likely means going through your PowerPoint slides as a form of preparation. This will be more effective if you can actually advance the slides on your computer, but it can also work with a printed copy of the slides. In either case the goal here is to work on flow, but also to know your slides so well that the transitions during your actual presentation are seamless. Super Preparation. Have you ever noticed a presenter who stumbled at the start of their presentation and never fully recovered? Would you like to avoid this and begin with confidence that you are ready to go? One strategy for building that confidence and early momentum is to super prepare the start of your presentation. One of the most powerful things you can do is have your opening 1-3 minutes so polished and so ready that you know that portion will go well. By having the critical opening so well prepared you build your confidence and truly get off to a great start. Any of these strategies will help you be and feel more prepared for your next presentation. They will take time, but it will be time well-invested, because you will avoid the sinking feeling at the end of your presentation that you didn’t reach your goal, or sent the wrong message. Tags: COMMUNICATION, LEADERSHIP, LEADERSHIP COMMUNICATION, LEARNING | Permalink. You are not alone if you feel that your social media program has gotten a bit out of control. Do you wish you had a social media policy? Have no idea what is being published when by your social media team? Have nightmares about a PR crisis or waking up to see a picture of you passed out at your desk on the cover of your Facebook timeline as a joke by your social media team? If these sound familiar, don’t freak out on me. It’s okay. The first step is acknowledging them which this post will help you do. The second step is taming that wild social media beast and learning how to get a grip on your social media once and for all. The #1 question you need to answer to get a grip on your social media is WHY! Why should anyone care what you have to say? Why should anyone like you? Why should anyone comment on your Facebook posts? Why should anyone talk to you? Why should anyone ever visit your Facebook page after they click like? 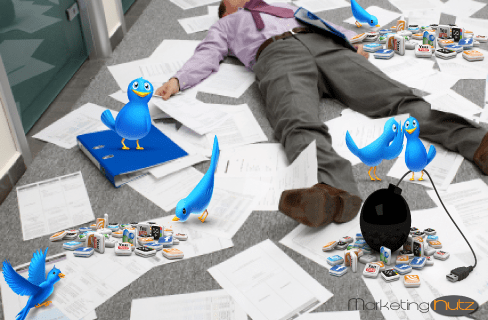 Social Media Is Not Going to Save Your Business! Social media is nothing more than a tool, a medium to help you connect with the right people and businesses to enhance your life and grow your business. It’s similar to networking but with a lot of tools that come along with it. Learning the tools is only a small part of what’s required to see results using social media. Many people double spin on learning the tools but never learn the art of social media which includes engagement, inspiration and connecting, truly connecting with their audiences and communities. You must start on the inside of your organization and work out. You must at the same time start on the outside of your organization and work in. The goal is to understand yourself as well as you do your clients and communities. You must know what they need and know exactly how you can provide value, relevancy and help them solve problems. Goals and Objectives are a Must! To see real results such as enhanced brand equity and awareness, increased leads, growth in web traffic, growth in email subscribers, increased revenue or whatever your business goals and objectives are, you must obviously know what goals and objectives you want to achieve. Developing a social media program with no plan, goals or objectives is like expecting to get on a plane for vacation with no plane ticket, itenerary or idea where you are going when you get to the destination. You need more than a set of random acts of social media and marketing (RAMs). RAMs will eat every last morsel of return on investment you have left. The best way to identify a RAM is that it is not funded, resourced, in the plan or have metrics to measure success. This post is part of series I am writing “Get a Grip on Social Media. The series will help get your business in tip top shape for real results. For purposes of this post I take a light hearted approach to understanding signs of needing to get a grip on social. Often times doing something or being something seems unreachable. However, if you can look at certain behaviors and understand that they in themselves may be stopping you from achieving desired results then it’s a good step forward. 1. You are already wondering how many of these signs are going to hit home for you. Your blood pressure may have even soared few points. 2. You have already printed or planned to share this post with your CEO, partner or boss. 3. You wish this post had more on how to “get a grip on social media” instead of telling you what you already know is true. a. Was implemented with a template you found via a Google search by an unknown author. b. Was implemented with a template that came in a direct mail piece you received in the mail last year. c. You developed the social media plan on a two hour plane ride to visit your grandma in Kentucky. 5. Your CEO or Owner of your organization does not know you have invested any resources in social media. If they find out they will likely kill the project and fire you. 6. If I gave you 60 seconds to name every social media network you are on, it would either take you 2 seconds because there are none or you couldn’t answer because you don’t know. 7. If there was an emergency, PR crisis or urgent need of any sort you have no idea where to find the logon and passwords to your social media accounts. 8. Social media policy? What’s that? We have good employees, we don’t need policies! 11. The new hired marketing manager’s face turned bright red when she was asked to engage with real clients and partners on Facebook, Twitter or LinkedIn. 12. Your social media team consists of you and your social media intern who has no business experience. 13. Your social media consultant consists of your dog, your husband and your 7 yr old son who knows more about Foursquare and Twitter than your CEO. 14. Your 7 yr old son knows better than your social media team and CEO that it is stupid to buy Twitter followers and Facebook likes if you want real business results. 15.You have been executing social media for a year but couldn’t articulate your objectives and results even if it came with a free “get out of no Likes Facebook jail card” . 16. Random acts of social media and marketing is your way of life. Your boss has earned the “RAMs RAWK” t-shirt. 17. Nobody within your organization has been properly trained on how to use social media for real results. 18. When I talk about “integrating social media into the DNA of your business” it give you nightmares. 19. When I write “you need goals and objectives” in every post I publish you want to throw a tomato or other rotten vegetable at me. However, you know I am right and that is why you still read my posts. 20. Your social media team and other departments still work as silos. They spend half of their time competing, debating and arguing on the best way to implement social. Hello…. this is where a plan will help get everyone marching to the beat of the same drummer! 21. Your social media priorities are driven by your CEO or Board of Directors and whatever class they most recently attended. If it was a Pinterest class then Pinterest becomes the priority of the week or month. 22. You are the only one who executes social media at your organization. Primary reason is you have no plan and it’s easier just to do yourself. 25. Your management team decided to put social media on hold for three more months. They think it’s okay to quit posting to Facebook for a few months and that you can always come back to it later when you have some good coupon offers in the New Year. 26. You have no content plan. You post content and status updates to your business social media platforms based on your own personal mood. 31. You have never thought about the term relevency in regard to social media. You think “hmmmm…. posting relevant information might actually get people to read it and become interested in my business.” Yes, keep up with those thoughts… we are making progress! 33. Sentiment? Sounds cool but you don’t know what it means or how to measure it when it comes to social media. 34. Social listening? Your idea of social listening is heading to the nearest bar and gossiping with other “social media gurus” about your assumed competition. Unfortunately for you your competition has done their homework and already know what sentiment, ROI, social business integration means and how to both implement and measure it. 39. Your social media efforts are not funded. You have resorted to an online yard sale and an employee kitty to obtain enough funds for a new intern and design for the new Facebook page. 40. You have nightmares about your website and the multiple teams working on content. You know your brand is being dilluted and you have no idea how to fix it. Reminder, this is where the plan comes in useful again. Go ahead… throw a tomato at me, I’m use to it. 41. You are confident you are losing touch with your audiences including clients, colleagues, partners and associations. 42. You really do want to stop begging for Facebook likes. 43. You are not dealing with any of these issues head on. You are ignoring them and up to now was hoping, wishing and praying they would go away. 45. You are going to read this list again and count the number that hit home for you. Don’t do it. Your time is better spent working on your plan inclusive of business goals and objectives. Get to work my friend! If you need help, call me. Tags: @PamMktgNut, Best Practices, Social Media, strategy | Permalink. 1. You are not a man so don’t try to be! This also extends to how you dress at work, keeping it feminine but appropriate. Outside of work this means not trying to be ‘one of the boys’. 2. Work is NOT a popularity contest. Great bosses and colleagues are respected not liked. Women frequently value being liked and worry what others will think if they say or do certain things. You have been employed in a professional capacity so put the insecurities aside and above all else act like a ‘insert your job title here’. 3. An extension to point 2: don’t ever put being liked above being smart. The ‘boys’ might like you for it but the bosses won’t promote you for it. For those of you with tertiary qualifications you are more than likely employed for your brains. Use them! 4. Women often focus too much on building strong relationships with their clients and not enough time looking to understand the business their clients operate in and honing their strategic skills and business insight. When a client moves and there isn’t a chemistry fit with the new person you will leave your company (and your own position at the company) exposed. 5. Women are far to tough on themselves. Most women develop and mature professionally quicker than men and have more EQ (Emotional Intelligence) so tend to dominate many of the sectors of male dominated industries that are relationship focuses (ie Advertising). However when it comes to career advancement they are often shy. Men tend to think they are at least half a role of job title ahead of themselves and will demand it. Women are the complete opposite and almost talk themselves out of a promotion and place themselves half a role or title behind where they usually are performing. 6. Not knowing how to say no. Don’t fall into this trap: ‘It’s the end of the discussion when a man says no, but the beginning of a negotiation when a woman says it’. Trust yourself and be firm. 7. Not keeping healthy, defined boundaries between work and leisure. 8. Not delegating! Naturally good multi-taskers women often struggle to delegate work. 9. Don’t sleep with any man at work, unless you plan on marrying him. Tags: career, job, men, women, work | Permalink. How you present at interview is so important. But have you thought about how your body language will either support or kill your chances of securing the job? Being given an interview is exciting and your preparation starts straight away – what you will wear, how you will get there, researching the company, studying your resume and rehearsing interview questions. Very few candidates actually stop and think about body language. We all know that first impressions count. When you first meet your interviewer you want to be brimming with confidence: a great big smile, firm handshake and an audible “nice to meet you” whilst looking into the interviewer’s eyes. Imagine if you met an interviewer with a tiny little voice which screams “timid”, a limp handshake and someone who looked at the floor or muttered into their shoulder when they spoke … not a good impression and it wouldn’t fill you with confidence about their ability to interview you fairly. You’ve worked hard to get to interview stage, so put some real thought and preparation into your body language. There is no better way to prepare than to practise. Stand in front of the mirror and see what you look like. Silly as it seems, it’s a great way of finding out how others see you. Video yourself (enlist the help of a friend if necessary), but you need to watch the way in which you present yourself and your message. Body language is not just the physical aspects, it is also your voice. How do you project message? Do you have an audible voice? (notice your pitch and tone) Painful as it can be, record yourself and then listen back – a great way of modifying your voice. Sometimes when people concentrate on an answer, as happens in interviews, their voice drops down a few notches. Hearing this in yourself and being aware of it can help you overcome the problem at interview. When I first started recruiting I was amazed at the number of people I interviewed with poor body language. I could never understand how, after working so hard for an interview, they could blow their chances in this way. One candidate, a lovely woman with an impressive background and the skills my client sought appeared to be the ‘perfect’ candidate on paper. At interview though, she seemed to shrink into herself. Whenever I asked her about an achievement or situation she had handled she crept back in the chair, went red, cocked her head to the side and lowered her voice when answering. These were her achievements – she should have owned them, been proud of them, expanded on them and confidently spoken about them! Other people give you gruff one-word answers or direct you back to their resume, “Well, it’s all in there if you look at page 2”. I am sure it is a symptom of nerves for most people, but irrespective of the reason, it doesn’t impress interviewers and most certainly doesn’t present you in the best light. So, how do you make sure your body language is appropriate for an interview? Don’t keep your hands in your pockets. Never cross your arms – it makes you look defensive. Don’t hold your handbag/briefcase or portfolio in your lap – it makes you look like you’re ready to bolt! No slouching – sit up straight and tall. Never look away from the interviewer when answering questions or when they are talking to you – maintain eye contact. Fidgeting such as shaking your leg or tapping your foot or drumming your nails on the desk is annoying and distracting. Staring at the wall or floor – nothing screams disinterest more! Relax to the point of appearing blasé – leaning back in the chair in a relaxed manner more suited to the lounge at home, or resting your head on your hand with an elbow on the chair. Don’t rub your nose every time you make a point – some say it is a sign of deceit. Never lean on the desk and towards your interviewer – it invades their space. Body language is relatively easy to control. Simply being mindful of it can help enormously. Have a think about your last interview – do you recognise any of the above points? Next time you have an interview put your best foot forward, a strong confident voice, loads of eye contact and a professional presentation, to give yourself every chance of being offered the role. Tags: body language, getting employed, interview body language, interview do's and don'ts, interview preparation, interview presentation, interview questions, interview tips, job interview, job interview advice, job interview preparation, job interview tips, Job Interviews, job search, Job Search and tagged applicant interviews, presentation skills, win interviews by resumes. Bookmark the permalink | Permalink.